Unlike my friend, Chris Nelson (@oilandbones), I like to wear pants. They keep your legs warm. They offer visual appeal much greater than white, hairy legs, and if produced properly from the right materials, even offer protection for when you’re riding a motorcycle. 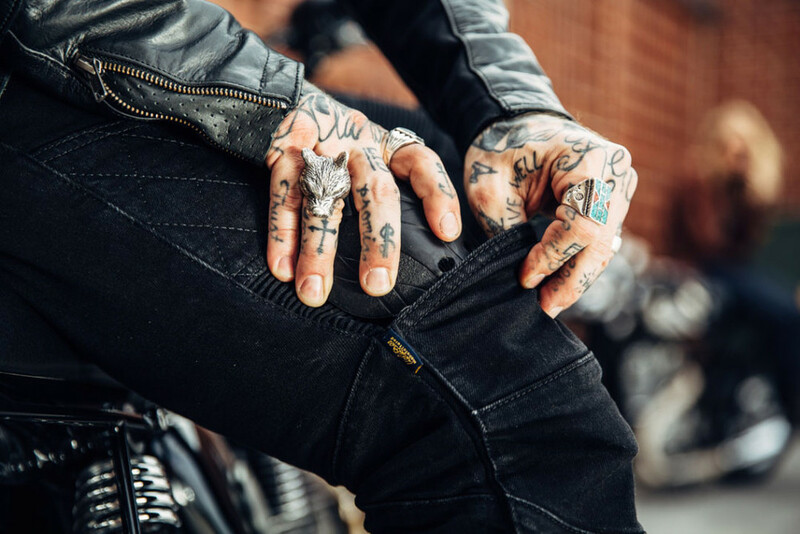 So as much as Chris would probably like this BLOG post to be about him and his adventures not wearing any pants, it’s about me and my ongoing quest to find the great jeans that can be worn both on and off a motorcycle with little compromise. Humor aside, let’s talk about something more serious. Motorcycle safety. Specifically, pants. Everyone knows there simply isn’t anything better than good ol’ tough cowhide for protecting your skin in the event that you lowside while trying to flash a smile at that pretty girl when rounding 2ndstreet downtown on Saturday night. However, the problem with leather is that, for a dude, unless you’re a cowboy or the lead singer in a rock band, you look pretty silly wearing leather pants. So going on the assumption that you’re not a Creed fan and never condoned Scott Staff’s use of leather pants to look “cool”, I’ll assume you’re a fan of denim. Right? Because I’m not a denim expert, I won’t try to act like one. I will simply say that there’s a myriad of styles, types, and thicknesses of Denim out there. With today’s moto crowd, one of the most popular seems to be Selvedge, so for ease of relation and relevance, I’ll pick this for my example. In most cases, selvedge denim is both thick and somewhat rigid when compared to what you would find at the GAP, for example. This tends to be good for motorcyclists, not only because it looks pretty damn good, but it has a higher abrasion resistance than soft cotton blend denim found in the majority of jeans on the market today. The problem, though, with the selvedge denim moto jeans I tried on that had armor, was that looked like “they were jeans with armor in them” and, for me, that dog just don’t hunt. I’ll admit it; I spend more time in front of the mirror than Leticia does. It’s true. And I probably spend more time matching my jeans to my shirts, too. Is that a crime though? So there I was, left to durable Selvedge denim jeans and denim blends with interior Kevlar linings, which was great, because I was able to look good and be somewhat safe. But after just eating pavement, being pulled on a skateboard by our Wolfdog Jack in a pair of Kevlar lined jeans and having a very sore hip and knee, I resigned to the fact that some armor was a necessity. Which leads me to my discovery of uglyBROS jeans. Granted, they’ve been around for quite a while in the Eastern Pacific market. I’d heard of them before and figured, “What the hell, they’ve got armor in them and tend to look a little more fashionable and fitting than some of the other jeans I’ve tried to date.” So I gave them a call, ordered a pair of their TONUP jeans in black, and patiently awaited their arrival. When I got them, they fit perfectly. The only thing that needed to be done was hem them to length. Putting them on was like slipping on a broken-in race glove. They hugged my body in a way that just made me feel safer. Slip in the knee pads and hip pads, and you actually are. Which brings me to something I want discuss. When I was in Los Angeles, recently, I met with Vince Sohn, the founder of uglyBROS USA, and the first question I asked him was, “Why didn’t their signature jeans have Kevlar in them?” Vince’s answer was short and sweet. He explained that while Kevlar does provide additional protection against abrasion, it does virtually nothing in regard to impact. In research uglyBROS did in Asia (more motorcycles on the road there than anywhere else in the world, I’ll remind you), accident victims suffered from pain as a result of impact, not being drug across the pavement. So in the beginning, when uglyBROS went to market, they wanted to address that need. So why do their jeans have CE approved hip and knee pads? Yep, you guessed it. Those same motorcycle accident victims had the majority of their pain related to hip and knee injuries. Pretty simple theory, right? Research a need and fill it. uglyBROS uses an a high quality denim blend when producing their jeans, ranging from 11-13.5oz. With stretch panels in key areas related to fatigue, riders can spend hours on the road without feeling constricted. Their unique design and cut allows them to be both rigid and protective without sacrificing comfort, which is also awesome if you eat a few too many hamburgers on the road. And for those of you who think the TONUP or other styles offered by uglyBROS are a little too fashion forward, they also have more traditional style jeans that yes, have Kevlar lining and also support internal armor. heckout the ECHO-K for example. As for real-world testing, while I haven’t eaten any pavement, I have chewed on a bit of dirt while wearing them. I wore mine Flat tracking withRoland Sands and the Suicide Machine Co. boys at Perris Speedway and took a serious lowside on a CRF450 around turn three. I slid, the jeans held up, and nothing hurt the day after. Pretty good testament, in my opinion. And if that’s not enough, despite what people think, Ugly Bros isn’t a huge corporation. Vince is part of a small team of guys, who just like keeping people safe on the road and looking good at the same time.